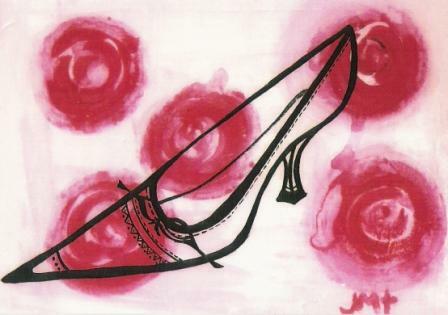 Jennifer M Taylor is a contemporary artist who creates innovative collages of vintage fabric, buttons and paper assembled around images of stiletto shoes. "Taking the image of the stiletto shoe as my central theme, I collect items such as old tickets, cards and book illustrations to form a collage with vintage fabrics and buttons. On canvas boxes, I build up textured layers with these materials and dragged paint, adding text and writing to add a story-telling element. The varnished finished work is a panel which is easy to handle and ready to hang in the house. The association of playing cards, jigsaws and domestic objects reflects the house and family I grew up in and which will be familiar to others through their own memories. These are my Shoe Memory Boxes"
Photographic images of my work can be seen on the images pages on this web site. Details of exhibitions displaying my work are also available, together with a list of galleries with which I am associated and which are currently displaying a selection of my designs. To understand a little of my background and the sources of my inspiration, you can read my statement page. To contact the Pink Shoe Lady or view current sales information, please visit the appropriate pages.